Instructors may select and place materials on course reserve for student use in specific courses. These materials may include books, copies of journal articles and book chapters, DVDs, CDs and other materials. Students request reserve materials from the circulation desk. These materials circulate for limited time periods, with varying fines. You may want to consider using online articles from the library databases or online journal subscriptions, which students can access on or off campus anytime. From the Library home page, choose Electronic Resources to access the databases. If you have a specific article in mind, use Journal Finder to search for the journal title. You can also put links to these articles into your Blackboard Class sites. See Blackboard: Linking to Articles on the Library Web site under Library Services and then Faculty Services. We have more than 80,000 ebooks in different academic subject areas, available to Gordon College users on or off campus anytime. They can be accessed from the NOBLE catalog and from the library website Electronic Resources E-book page. You can also put links to ebooks into your Blackboard Class sites. See Blackboard:Linking to Articles and Ebooks. Please complete the Course Reserve form. Be aware that if you leave the page inactive (without submitting) for longer than 1 hour, you will lose the information you have entered. If you are going to use chapters from a book for more than one semester, you may want to request the library to purchase multiple copies of the book to put on reserve instead of making photocopies and paying for copyright permission repeatedly. On the Course Reserve Form, select Purchase Materials for Reserve. Purchasing the books may take 1-3 weeks. Please plan accordingly. The library may not purchase more than 5 or 6 copies of a book for reserve. If you need more copies than that, you may want to consider making it a required textbook for the students to purchase. Materials are processed in the order in which they are received. It may take 2-5 business days to process the materials. Photocopies of articles or book chapters will take longer if they need copyright permission. To insure that materials are available for students when needed, please fill in the course reserve form and submit your materials as early as possible. As required by copyright law, please write the full citation on all photocopies of book chapters or journal articles. If there is a title for the chapter, use the chapter title with the author of that chapter. If there is no chapter title, use the book title followed by the chapter number or page number. After you have submitted your reserve list, please bring your personal reserve materials along with your name and the Course ID to the circulation desk for processing. For your convenience, library staff will retrieve library materials for you to put on reserve. However, it is the faculty's responsibility to photocopy materials. 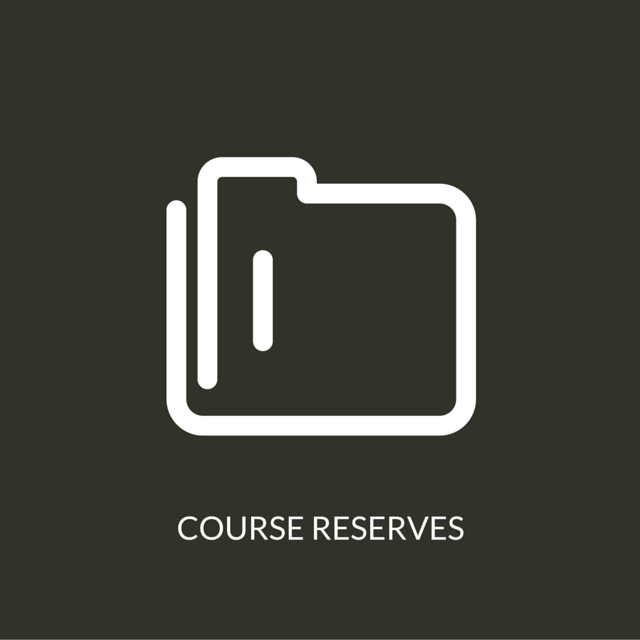 You can go to the Course Reserve page to see when your reserve materials are ready for students to use. Use the “Browse” button to view the list of courses by instructor's last name, course ID, or department. If you have questions about copyright and the reserve process, please contact Alec Li by phone at x4341 or by email. There are a lot of books and journals that are in public domain. Most government documents and books published before 1923 are in public domain. These titles do not need copyright clearance and many are available online free. See Free Online Collections. Photocopies of materials usually require copyright permission to be put on reserve unless they are in the public domain. If necessary, the library staff will act on your behalf to acquire the copyright permission for course reserve. If you make photocopies of one chapter of a book or one journal article for the first time for one course, it is considered "Fair Use" and may not need copyright permission. Please look at the following webpages for more information related to fair use and copyright issues. Code of Best Practices in Fair Use produced by the following coordinators: Association of Research Libraries, Center for Social Media, School of Communication, American University, and Program on Information Justice and Intellectual Property, Washington College of Law, American University. Checklist for fair use published by the Copyright Advisory Office, Columbia University Libraries.